A customer was experiencing a high failure rate, during accelerated life testing on one of their PCBs. The same fault was causing the problem each time. 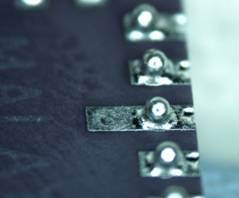 The problem was of cracking solder joint(s) on a Leaded Chip Carrier (LCC) which was soldered directly on the PCB. It was discovered that the LCC created a lot of heat, with no space under the component to dissipate the heat. The thermal imbalance between the IC and the PCB caused the solder joint to fail. To fix the problem Retronix fitted Plastic Core Solder Spheres (PCSS) to the pads, which don't collapse. The PCSS created enough 'standoff' between the IC and the PCB which allowed the heat to dissipate. Also having the exact same spheres on the exact same pads also guaranteed the RF inductance on the part. This solution reduced the failure rate on the PCB by a factor of 10, eliminating the issue as a weak spot on the component.